The cello part for Tchaikovsky's Piano Concerto No. 1 in B-flat minor, Op. 23 has been edited by Stephen Geber, who served as the principal cellist of the Cleveland Orchestra for 30 years, from 1973 until 2003. Geber's bowings, fingerings and other editorial markings have been added throughout the score. Tchaikovsky's Piano Concerto No. 1 was composed between November 1874 and February 1875, later revised in the summer of 1879 and again in December 1888. The first version received heavy criticism from Nikolai Rubinstein, Tchaikovsky's desired pianist. Rubinstein later repudiated his previous accusations and became a fervent champion of the work. It is one of the most popular of Tchaikovsky's compositions and among the best known of all piano concertos. Download and print the score today to gain access to expertly edited Tchaikovsky Piano Concerto No. 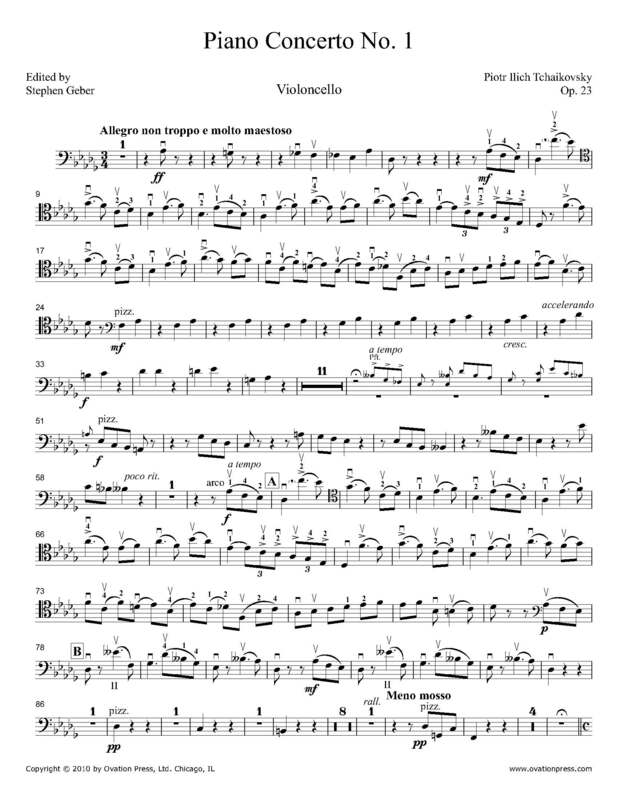 1 cello fingerings and bowings from Stephen Geber!